My name is Sushanta Meher (Sushant). 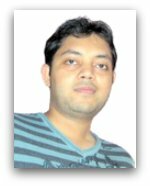 I am a software engineer by profession and currently working as technology lead with a top IT firm in India. Apart from my profession I like blogging, painting and travelling. I love to surf internet and stay updated about technology, finance and anything interesting happening around the world. I blog about my experiences in tech or finance related areas at SMeher.com. To know more about me or to get in touch with me please subscribe to me in Facebook | Twitter | Google+.